The LCCC runs several khanacross events each year, and this will try to cover what challenges you can expect from a khanacross, and what you need to bring with you if you wish to compete. The definitive regulations are in the CAMS Manual of Motorsport, which you will want to read for yourself. Khanacross regulations can be found in the auto test category. Let us start by saying that a khanacross is not a high speed event. Although the results are determined by the use of a stopwatch, khanacross rules require that no section of the course be longer than 100 meters without a significant change of direction. This way the top speed you reach will be limited and thus the danger to yourself and your vehicle will be minimised. 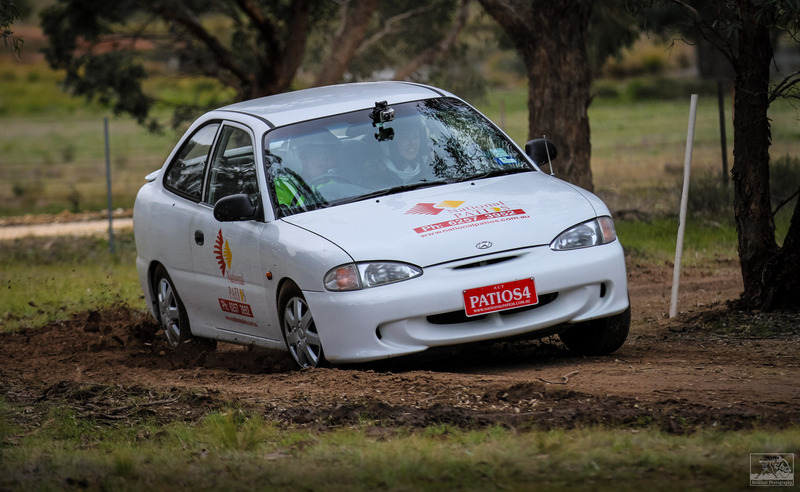 Khanacross events are meant to be an introduction to motorsport, so they can be run on almost any surface (but as the LCCC is rally focused this will usually be dirt). They will not require the driver to engage reverse gear, and can accommodate drivers from as young as 12 years of age. To compete in a khanacross you will need a car. This car does not need to be road registered but is required to be safe for use. By this we mean that the seats must be securely attached to the bodywork, it must have seatbelts, the brake pedal must feel appropriately firm, the steering must not have excessive play and the tyres should have legal tread and be not significantly damaged. The seatbelts must be of at least three point standard (lap-sash), appropriately attached and in good condition. There are some technical requirements like the throttle cable having two return springs and the positive battery terminal having an insulating cover, both of which are safety requirements for registering a modern car and you will find the vast majority of cars are compliant without modification. The car must also carry a fire extinguisher. This is required to be of at least 900 grams capacity and will need to be restrained in a manner that can withstand 25G of acceleration (i.e. being involved in a crash) without moving around the car. Plastic mounts are generally unacceptable, so please make sure any fire extinguisher is equipped with a metal mounting bracket prior to purchase. There are also age and testing requirements for extinguishers but it is safe to say that any extinguisher less than two years old will pass and most qualify until they are three. After they have reached their relevant age limit their life can be extended through inspection, but it is generally considered more economical to simply replace them. The exact details are discussed under General Requirements for Cars and Drivers in the CAMS manual, and you can also discuss them with your scrutineer if required. We welcome everyone along to our events, experienced competitors and novice drivers alike. We often have young competitors who have barely driven a car at all, and they are able to learn invaluable skills and experience before they start to drive on the road. Irrespective of the type of car you are competing with, you must wear a helmet. The specific requirements are also discussed under General Requirements for Cars and Drivers. To summarise it briefly, most motorcycle helmets that still have all their original stickers on them (to demonstrate compliance with the relevant Australian standards) should comply. Issues may arise if the helmet lining is ageing poorly, or if the shell has been damaged or been painted/covered with stickers. Any of these can compromise the safety of the helmet. If you present an unmodified helmet that is visibly in good condition and has its standards stickers attached, you should be fine. Clothes made from any flammable synthetic material (like nylon) are unacceptable and wrist to neck to ankle coverage is mandatory. So a long-sleeved, non-synthetic shirt, a pair of jeans and some sand-shoes would be fine. If you are competing in a normal, fully-enclosed road car then aside from the helmet and a requirement to wear “sensible” shoes, the clothing requirements are literally “a minimum of short sleeved shirt/t-shirt and short pants”. Compliance with the open vehicle requirements (particularly the lack of highly flammable materials) is still a good idea for all competitors. If you want more detail on apparel requirements these are also listed under General Requirements for Cars and Drivers. There is no need for a navigator in a khanacross. For drivers who want or need an instructor to travel with them (for age or other reasons) the passenger seatbelt and seat must be in good condition, and both vehicle occupants are required to wear a helmet. The membership and licensing requirements for the instructor will be determined by the Clerk of Course. Each event has a designated scrutineer who will inspect your car before the event and help bring it up to spec if possible. The above is a summary of the CAMS rules that apply to khanacrosses. Additional rules can be added by the organisers of the event, and details about these changes are supplied through the event’s “supplementary regulations” or “supp-regs”. Common changes for LCCC events include the requirement for each competitor to provide a rake to help rehabilitate the paddock after the event, and a general requirement to use road tyres (i.e. not rally tyres). So please read the supp-regs thoroughly before coming to the event. A general requirement to use road tyres does not just mean a ban on tyres marked “for rally use only”. Anything that is clearly designed solely for use on bitumen is fine, but aggressively retreaded road tyres or even tyres designed for 4WD purposes should not be used, as this defeats the intention to prevent significant damage to the track surface. If you are unsure whether your tyres are suitable please discuss the issue with the Clerk of Course before the event. It is important to make sure the tyre pressure is in the manufacturer recommended ranges, as low pressures can allow the tyre to be easily unseated from the rim of the wheel and start to leak. Road tyre pressure requirements are very different to that of rally tyres, which can be run at much lower pressures thanks to their reinforced construction. As we generally are using a dirt surface some minor stone chips are likely to appear in the competing car’s paintwork, so if your car is new/pristine you may wish to borrow a vehicle or be prepared for the consequences. Some courses have bumps and ruts that can damage a car if they are driven over without slowing down. In general it is the drivers approach that will determine if a car will be damaged, but as a general rule, if you want to preserve the car you need to be going slower than the fastest competitors at the event. The fastest vehicles will be either rally cars which are strengthened or a cheap car that is to be scrapped when it inevitably reaches a state of disrepair. The usual warning statements need also to be made that motorsport is dangerous, and it is possible for you to hurt yourself and/or damage your property while competing in any event so please consider this before entering. Beyond the above you will need a relevant CAMS license and a current membership of an invited car club to compete at a khanacross. To keep costs down the LCCC generally runs its events for club members only, but one-day memberships can be purchased for only $10. The basic non-speed CAMS licenses can also be procured at the event, and these are valid for a year from the date of purchase. If you are interested in the form you need to fill out and/or the costs involved with a CAMS license, then that information is available here. Club membership costs are outlined on our Join page. The usual khanacross entry fee is $50, or $25 for people 21 years old and younger. With all that said these events are a bucket load of fun and we recommend that everyone should have a go at least once. We find that they are also great at teaching more advanced car control to young drivers and novices in a controlled environment, which ultimately makes them safer drivers on the open road.